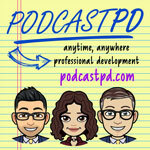 In this episode, we reflect on the latest installment of EdCamp New Jersey! Our conversation includes some live recording we did during the event and we’re excited to share our feedback and conversation on our 7th edcamp. The 2018 12 Days of PodcastPD are coming! We’re looking for your submissions to round out our 12 mini-episodes that will be released from December 26-January 6. Tell us why this podcast is awesome and the value you’ve gotten and what people can expect. Visit podcastpd.com/feedback where you can send us a voice message right from your computer. This post may contain links to products or services with which we have an affiliate relationship. We may receive commissions or bonuses from your actions on such links.